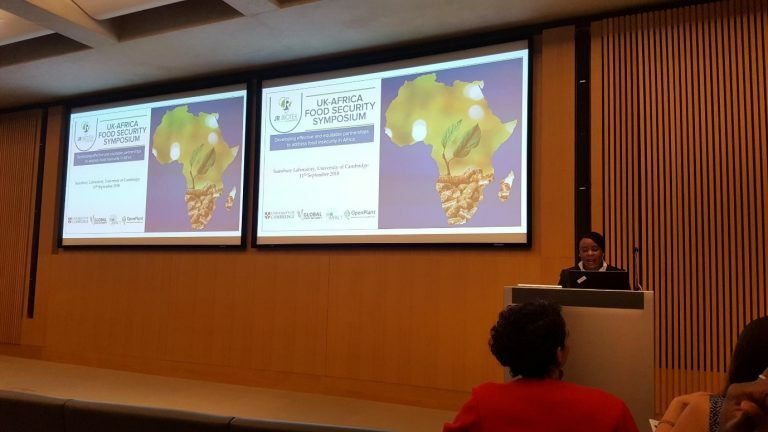 University of Southampton BRECcIA researchers, Genevieve Agaba and Matt Kandel, were sponsored by Biotek Foundation to attend the UK-Africa Food Security Symposium on 11-12th September 2018 at the University of Cambridge. 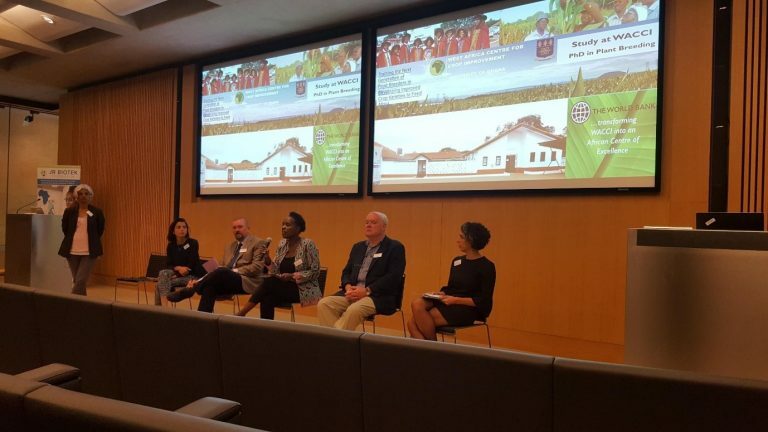 Panel sessions included discussions around how regional and international research partnerships can be designed to help tackle food insecurity in Africa. Another discussion point centred on how these partnerships can be leveraged to build capacity for research in tertiary education institutions. Carol Ibe, Founder of Biotek Foundation, opening the Symposium. © Genevieve Agaba, September 2018. Universities in Africa tend to be under-resourced for research and teaching, which undermines the quality of both of these activities/services. Curricula are heavily theory-based with not enough time or space allowed for practice with specialised equipment or application of specific research methods. Infrastructure needs to come to the fore in research capacity building, particularly if specific facilities are required. If the data can’t be generated, this already limits what research can be carried out. Education underpins everything else and the quality of education systems in partner countries/institutes shouldn’t be overlooked. Not only is infrastructure lacking due to funding, but there is also a lack of in-country researchers who are suitably qualified. This has implications for mentorship of younger researchers. The African continent currently has 198 researchers per million people, according to The World Economic Forum (2017). The report mentions 20,000 professionals leaving Africa every year for high-income countries due to a lack of opportunity. Building capacity in research requires patience and persistence. Long term partnerships and building trust is very important for projects. Environments need to be created where ideas thrive. Strengthening the capacity for innovation will be the foundation for transformation of agriculture in African countries. African institutions often have to partner with UK/EU institutes in order to access funding, which can create an inherent power imbalance and can also force partnerships that wouldn’t naturally happen (although the ‘forcing’ of partnerships could also be seen as a positive). It can be more balanced in terms of power relationships when institutions develop strategic priorities and plans without budgetary pressure. Scientists need to be more embedded in public policy and industry to understand national priorities and enhance the uptake of evidence in these different spheres (which would lead to greater research impact). We should move beyond a simple ‘food security’ paradigm in order to explicitly acknowledge the importance of nutritional dimensions as well, by using the term ‘food and nutrition security’. It’s not enough to use quantity of food or crop yields as indicators of food security, there are examples of people producing enough but selling off their main protein sources (e.g. milk, meat, beans) and eating ‘belly fillers’ such as maize meal. Many useful insights were gained from attending the event that will help inform how BRECcIA moves forward with its own capacity building activities. We now need to move forward in gaining a greater understanding of what has happened in the past (what works well/what doesn’t work well) and how to translate learning into action, all the while creating enabling environments for doing so. This includes ensuring that we develop a rigorous understanding of policymaker needs (on both national- and regional-levels in Africa) and how best to inform policy. Building on previous capacity building programmes in partner institutes and learning from other projects, BRECcIA will continue with its work of supporting a multidisciplinary learning environment for researchers to produce high quality research in the subject areas of food and water security. A panel session during the Symposium, discussing international partnerships and research capacity. © Genevieve Agaba, September 2018. This entry was posted in Conference and tagged Food security on 20th September 2018.